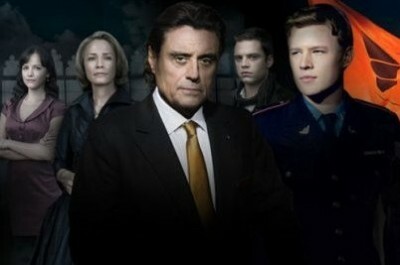 Performers include: Ian McShane, Christopher Egan, Dylan Baker, Susanna Thompson, Eamonn Walker, Michael Patrick Crane, Allison Miller, Sebastian Stan, Jason Antoon, Joel Garland, Wes Studi, Marlyne Afflack, Sarita Choudhury, Steve Rosen, Macaulay Culkin, Becky Ann Baker, Hisham Tawfiq, Kadin George, Kobi George, and Quarles Antoine. A retelling of the King David story from the Bible, this TV series revolves around power struggles, romance, secret alliances and a young hero who rises to power in a modern-day kingdom. Living in the pristine capital city of Shiloh, Silas must deal with the rising tensions between Gilboa and the neighboring nation of Gath. When several prisoners of war are taken, a young and idealistic Gilboan soldier named David Shepherd (Chris Egan) defies orders and crosses enemy lines to save them. Unknown to David, one of the soldiers he saves is Jack Benjamin (Sebastian Stan), the king’s ambitious son and a closet homosexual. David becomes an instant star in the national media, much to the chagrin of the prince. Silas promotes David to Captain and thrusts him into the role of media liaison. David finds himself surrounded by a world of royal court policies, unaware of the many different forces at work, including Gilboa’s head of the military, General Linus Abner (Wes Studi). David soon develops feelings for Princess Michelle, the king’s beautiful intelligent and outspoken daughter, and she seems to return them. David also experiences the “living crown” of butterflies which seems to indicate that God has chosen a new ruler, much to Silas’ chagrin. Religious leader Reverend Ephram Samuels (Eamonn Walker) has backed Silas but begins to change his mind. But the king has other challenges as well. His policies and actions are being manipulated by his brother-in-law, William Cross (Dylan Baker), who holds a great deal of influence over the royal treasury. The king is married to the supportive yet distant Queen Rose Benjamin (Susanna Thompson). Silas secretly sees a mistress named Helen (Sarita Choudhury) who he once gave up in order to marry Rose for political gain. Aside from their affair, Silas and Helen also share a young illegitimate son. Jack is getting nervous as people loyal to him start turning up dead; he fears Silas’ return. William berates him for his weak stomach and tells him to grow a pair. Meanwhile, King Silas takes over the radio and announces to the people that he is alive and that evil men have taken over the government. He asks the people to support him and tells the usurpers that he is the rightful King and that is coming back to Shiloh. A remorseful Samuels stops to question Jack. Jack is waiting for a sign from God that he is doing the right thing, but Jack says that he feels nothing. Samuels tells him he feels nothing because God does not keep council with sinners. Jack pleads that he will make good on the innocents that William has killed as soon as he is crowned. Samuels will have none of it and tells Jack that he is not the one God wants. Samuels’ words seem to have the opposite effect on Jack that Samuels intended. Jack returns to his advisors a hardened man; when an advisor voices a concern for Silas, Jack has him shot on the spot. Horrified, Princess Michele stands and asks Jack when he became more of a monster than their father. Jack orders a soldier to take aim and promises he will shoot her if she doesn’t sit. Seeing her children stand off, Rose rises beside Michele and asks him if he can shoot both of them. Jack breaks and orders them out. Rose councils Michele and tells her that in she must protect herself and her unborn child by keeping her head down and her mouth shut until Silas returns. Back with Silas and David, Silas seems to have recovered from his wounds. He and David are not yet reconciled. David tells him that he fights with Silas because he can bring peace not because he loves Silas. He vows to leave the second Silas is returned to throne and asks only that if God ever speaks to Silas again, that he listen this time. As things are prepared for Jacks coronation, William is informed that Samuels refuses to attend the ceremony. As Samuels expects, William sends a team to kill him. William informs Jack that the crown is gone and Samuels will not anoint him King. While Jack worries, William assures him that because Samuels has already publicly endorsed him the people will not care. Jack walks into the coronation and kneels as the ceremony begins while Samuels prays for forgiveness and asks God to live long enough to right his wrongs but is shot in the head before he can finish. Silas walks up the street toward the palace and a regiment of armed soldiers. Though they take aim he orders them to stand aside, William who has just been made aware, orders them to fire. Behind Silas, a squad of Goliath tanks follows. The rumbling disrupts the coronation and Jack is not crowned. Jack and William run out as David pops out of the Goliath and tells the soldiers to stand aside. William orders a soldier to find his son and bring him to the airfield. David reasons with the soldiers and asks that is they want peace they stand aside. They do and Silas enters the palace to be greeted by Rose carrying the true crown. Silas demands to know the whereabouts of Jack and William but the room is silent. Out of the silence, Jack walks to his father and tells him that God did not want him to be king. He tells his father that he is ready to die but Silas informs him he will experience worse things than death. As Silas sits on the throne, David leaves. Escaping through the tunnels, William cannot find Andrew. It turns out that Andrew is still in the castle, he tells Silas of Williams escape plans. When questioned by Silas, Andrew says he has learned who should be king and now that he has lost a father, and Silas has lost a son, he wants only to be a part of the family. Silas smiles. Back in David’s apartment, David is packing when Michele knocks on the door. Michele asks to run away with him, she tells him she would leave everything behind to be with him. For her loyalty, Silas offers Rose anything but she wants nothing. As they speak, Silas hears thunder and knows that God is talking to him. He goes outside so they can converse freely. He asks for God’s forgiveness and it starts to rain, taking this as a sign Silas is please but in the thunder he hears God ask for something he does not wish to do. He begs God not to go but the storm subsides. Inside, he asks Thomasina to find Shepherd. Back in the mansion, David and Silas speak. Silas tells David that God asked for David to stay and take Silas’s place. David does not agree but Silas thinks that God has been whispering in David’s ear this whole time. Silas stabs David with hot poker and starts to beat David. Silas calls God a backstabbing, cheating whore. David gets the upper hand and starts to viciously hit Silas, screaming that maybe he should be King. Horrified by the turn of events, David runs out and into Michele. He tells her Silas will never let them go. Michele and a wounded David run to the church to find Reverend Samuels, not knowing he is already dead. Samuels appears to them, apparently well. David tells Samuels that Silas thinks he has stolen his favor with God. Samuels explains to David that God chose him whether he likes it or not to be the new King. Samuels tells David he must run to Gath where Silas will never find him. He says that Michele cannot follow him but God will never leave him alone. Michele gives David her rings and tells him she will always love him. He tells her that he will never stop loving her. Samuels tells them they have exchanged vows of love before God and are forever married. Back at the mansion, Thomasina leads Lucinda into the comfortable room where Jack is being held. She informs him that Silas has ordered for him a living hell, trapped with Lucinda, whom he loathes because her adoration of him, until they produce an heir. Lucinda embraces him and he forces her away. Jack pleads with Thomasina but she leaves him. Michele runs into Rose’s room to find Rose and Silas together. Before a confused Michele, Rose orders Michele exiled for one year for treason. Rose whispers to Michele that this is necessary as Michele is led out by guards. Alone again, Rose tells Silas they will begin again. As Rose leaves, Silas begins to talk to Samuels who has suddenly appeared to him. Silas vows that he and God are now constant enemies. Samuels tells Silas that the day he lays a hand on David is the day he dies. In the Republic of Gath, David runs into the woods to hide. First aired: July 25, 2009. Courtesy NBC. Kings: Is the New TV Show As Good As Cancelled Already? The depth of characters found in that series made it the most profound of shows found on TV. To see all of the kinds of shows that get renewed, that offer nothing, and when a show with such talent and story gets cancelled, i think i will just have to boycott all of NBC shows. I guess some people cannot recognize quality shows when they see it. Furthermore, it doesn’t help if it didn’t get a regular time slot as one viewer suggested. Maybe, the spiritual themes were not appreciated by some people. That was one of the reasons I loved the series as well as the great cast of actors that were part of this production. I remember watching a few episodes of the show and wondering what happened to it. I recently ordered the DVD and watched all the series. That is the best quality programming I ever saw. Renew Kings you bozos! This was a mistake of epic proportions. NBC whoever is in charge of your programming has made another big mistake. Kings was one of your best production in a long time.